This essay, while longish and rather difficult, is nevertheless almost universally regarded as a brilliant and epoch-making masterpiece. Just do the best you can with it. I’ll answer as many questions as possible in class and on the blog. I really appreciated his focus on “aura.” It is fascinating to see where different people divide what constitutes as art, or rather, good art. The aura is an essential part of art, as auras are unique, they are the distinct personalities emanating from the work. Benjamin is asserting that much of this crucial aura has disappeared as the media in which art is presented has shifted for purposes other than sharing these uniquenesses. I certainly agree with his overlying ideas, in that the mechanization and industrialization of art can simply rob it of its individuality. The aura of live performance could never be beaten by movies, by recordings. However, I feel that there is much that can be gained in these forms of art that he asserts are devoid of uniqueness. He still finds the aura to be true in early photographs that show the “fleeting expression of a human face,” but beyond that, emotionless and empirical. I think that there are cases in which that is true, but I believe it to be a gross generalization. Photographs have the power to transport the audience to a different time, a different place, and truly expose them to a bit of that aura that they may have no other way to experience. I am incredibly fascinated by his seemingly noncommital view on the loss of aura. I cannot quite tell if he feels liberated from it, or is mourning it. The parallels he draws to shifts in warfare are disturbing, to say the least, and I am unsure on whether he approves or disapproves of this politicization of art. In reading this, I kept thinking of what we discussed about Pollock. His demise being exacerbated by the industrialization of his art demonstrates his desire for authenticity, for true expression, for “aura.” When his works were used essentially as wallpaper for magazine models, when he became an actor of sorts in his own life, his works were stripped of their aura, as was he. Your use of the word ‘aura’ seems almost suggest that individual works of art had distinct personalities and spiritual powers they exerted over humans. This, in fact, is indeed how humans once experienced art. Artworks were the agent and humans respected them and did their bidding. Mechanzation and large-scale industrialization have reversed the equation, making art now readily available to us immediately and cheaply on demand. The sacred experience once associated with art has now been rendered common and cheap. Benjamin, as you seem to have observed, is highly ambivalent in his response to this sudden and drastic transformation. While a demystified world in which no one acknowledges or respects any higher powers might seem appealing, Benjamin worries that a new set of power is arising to fill the power vacuum. His thought is that this transformation will lead to truly horrendous and destructive results if persons do not learn to understand the new forms of mechanically produced artworks, along with the entirely unprecedented political uses to which they can be directed. When Benjamin describes the difference between manual reproductions, which I assume is replicas of a work of art/object, and process and technical reproduction, I immediately thought of Andy Warhol who is now (in my opinion) one of the most esteemed artists during his time and really coined the whole Pop Art movement. Anyway, I would assume Warhol’s painting “Campbell’s Soup Can’s” and his Marilyn paintings would fall under the process and technical reproduction. However, from what I read (correct me if I’m wrong), processed and technical reproduction will never be as good as its original despite being a tad bit more original. Yet, processed and technical reproduction is far superior to manual reproduction because of the changes. Would Benjamin view Warhol’s two paintings as inferior to the original sketches of the Campbell Soup Cans and Marilyn? I found the statement about how art based reproduction instead of authenticity leads to political ties instead of ritual ones. Sounds like Benjamin is jabbing propaganda and advertisements. Benjamin, as I tried to suggest elsewhere, feels highly ambivalent about mechanically produced art. It’s appearance quickly wipes away values that had stood for generations and generations. It’s good to recall that propaganda, in Benjamin’s day, had yet to become a dirty word. In fact, it was only just becoming a recognized word. Benjamin’s hope is that person’s will learn to understand and use new art forms in the struggle for freedom. If they don’t, it can be all but guaranteed that the new art forms will be used in the service of oppression. Benjamin describes that art produced through industrialization appeals to an audience whose views are always distracted. With respect to Benjamins worry that people do not understand industrialized art, does this distracted state make the public susceptible to manipulation by political regimes? Is this the vulnerability he is getting at when he moves into Fascism and the propagation of War. Did Dadaism incite people to move deeper into this distracted contemplation by creating art that reflected the meaningless of modern society? Dadaism served, after WWI, to shock persons out of their traumatized state. Benjamin however sees that the challenges presented by Dada can work in two opposite directions – one continually reveals to the audience the discontinuities and contradictions of modern life, while the other actually trains the audience to find such contradictions and discontinuities perfectly normal and take them entirely in stride. Consequently, the Left must seize control of the new art and strategically direct it toward revolutionary ends. Benjamin has clearly done the mental legwork in the field he writes about. He pulls so many different aspects of art in a plethora of mediums, which gets a bit confusing but also makes him more respectable. My favorite part of his writing was his emphasis on “presence.” I always love exploring what makes “real art” and proves authenticity. I think he hit it on the head in saying the mechanical reproduction of art can produce the same type of quality or even better quality, but with the important caveat of diminishing the piece’s historical/traditional presence. He also touches on film in the later sections, making a perfect segue because film is the culmination of technical prowess to produce top notch visual and emotional art. I love the subject of film, so even though the way he wrote about it was all over the place, I enjoyed it still. Benjamin covers a host of topics at a very frantic pace because he is writing in a moment of extreme urgency. He is observing the rise of National Socialism in Germany, and that party’s systematic use of new media to create and control and mass identity. Events are transpiring very quickly and heading in an alarming direction. This piece of writing might well be read as a critical call to arms. Walter Benjamin examines the fascinating sense of “perception.” As time passes, perception inevitably changes, and Benjamin points out how new reproductions of art (particularly film) has played a huge part in an enormous fluctuation of perception in the past century. As he explains, the “adjustment of reality to the masses and of the masses to reality is a process of unlimited scope, as much for thinking as for perception.” The innate significance and tradition of art depends almost entirely on perception, because that is where the “uniqueness” of art becomes available to the beholder. The many reproductions that exist have destroyed uniqueness; we desire to bring things “closer,” in a sense, and we desire to see art from everywhere. Globalization and the increase in idea transmission throughout the world has caused an increase in a ratio of copies to originals, because the only way to bring everything closer is to reproduce it. In this day and age, everybody wants to know everything, see everything, hear everything. It leads to a feeling of being left out if we don’t succeed in bringing art closer. It decreases the value of each unique original. And yet, this change in perception and loss of uncommonness isn’t necessarily a bad thing. Photograph and film both reveal images that the naked eye can’t comprehend, and a spread of art across the “contemporary masses” may be beneficial to the overall well-being of the people. As I tried to suggest in class, the emergence of new technologies and mediums in not necessarily a bad thing. In fact, it’s simply inevitable. But as Benjamin insists, these technologies (infrastructure) emerge faster than consciousness itself (superstructure). Consequently, our tendency has always been to implement new media forms before we even know in what ways they might be either dangerous or beneficial. Indeed, this tendency is seen everywhere to be rapidly accelerating. 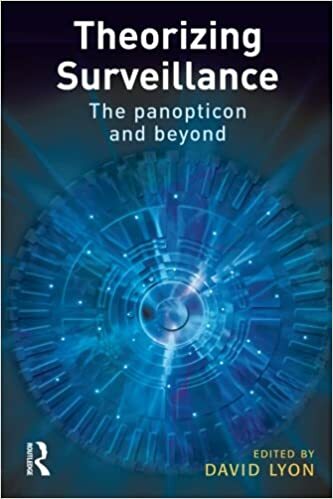 The combination of this unwitting accelerationism with a correlatively burgeoning sense of human curiosity has lead the the current world in which we live – surveillance society.